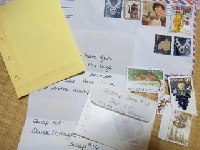 For this swap, you will have one partner and send as many stamp bags as the envelope allows. Please also return any full bags to their owners. All you need do is to put a few stamps (about 10) into an envelope. Add your postal address to the front of the envelope. On the back allow space for at least 5 individuals to sign and date the envelope before sending it on. Write instructions on your envelope (e.g. remove 3 stamps, add 5). STAMP BAGS ARE NOT DEFINITIVE DUMPING BAGS! Please ensure a balance of commemorative and definitive stamps. Please only include good quality stamps, i.e. not badly franked, torn or damaged in other ways (e.g. with sticky tape on). If possible, rather send commemorative than definitive stamps. Stamps should preferably be OFF PAPER, otherwise it all becomes too bulky.